I think this is the most anticipated release since that of President Mandela..LOL.. no really..this has been a trying time for fans, and family alike as one of music's biggest stars ever has spent almost a full year behind bars. 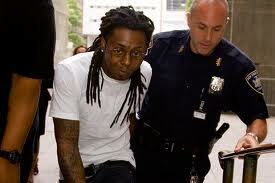 Wayne has been locked away since March for an attempted gun possession. Though he is set to be out today, here is a look at that tedious process according to his website. 1. Exit process set to start around 4 a.m. & could take more than 2 hrs! 2. His docket number will be ran to make sure he doesnt have any open cases or warrants! 4. Although the process sounds simple, the source says though unlikely, it could last into the night! Lets hope this all goes smoothly & Wayne can return to you his beloved fans and most important (in my opinion) his beautiful kids! Im super excited because I feel like he is about to come out a better rapper, overall artist, and most importantly human being! Blessings to him and I pray he can keep himself out of there in the future!!! Welcome home Wayne! Ok.. and I have been secretly dying on the inside everytime I read this somewhere but in light of him being released I'll say it once and only once #FREEWEEZY til they #FREEWEEZY POW!